The Canine Good Citizen Award is offered by the American Kennel Club for all dogs. The Canine Good Citizen program stresses responsible pet ownership and basic good manners and obedience for dogs. All dogs who pass the 10 step Canine Good Citizen test may receive an official certificate from the American Kennel Club. As you work with your dog to teach the required skills in preparation for the Canine Good Citizen test, you will discover the many benefits and joys of training which therefore will enhance the bond between you and your canine companion. 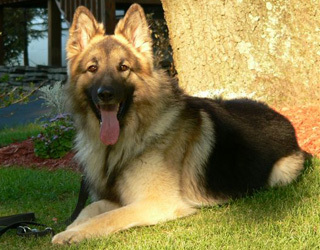 Earning a Canine Good Citizen Award indicates that your Shiloh Shepherd is certified to be of sound and stable temperament & has responded well to training. Furthermore, your Shiloh has demonstrated good social manners in public surrounding and in the presence of people and dogs that were new acquaintances. As a result, these combined efforts have assured that your Shiloh will always be a welcome member of your community and reflect well on the breed. The Canadian Kennel Club also offers their own version of the CGC, referred to as the Canine Good Neighbor Award, or CGN. The CKC test is only slightly different to the AKC version, with essentially the same goals in mind. The International Shiloh Shepherd Dog Club congratulates our long list of members who have achieved the Canine Good Citizens Award or the Canine Good Neighbor Award. The following dogs are highly respected ambassadors of the Shiloh Shepherd breed - we commend you!